Inspired by the audience response, the Chandigarh Sangeet Natak akademi (CSNA) will hold a four-day National Theatre Festival-2016, from August 29 to September 1, at the Tagore Theatre, Sector 18 Chandigarh from 6: 30 pm onwards. Here is the itinerary. August 29: Urdu play ‘Badnam Manto’ by Rangkarmee Kolkatta. The play chronicles episodes from the life of Sadat Hasan Manto, the writer of merit. Rangkarmee Kolkatta has taken theatre to the US, Pakistan and Bangladesh as well. August 30: Hindi play ‘Please Mat Jao’ by Third Bell Cultural Society Bhopal. The play explores the psyche of a modern lover in search of a rich life partner, who cheats on a sincere, devout but poor girl and later gets deceived by a prostitute. The play ‘ Honeymoon’ is a hilarious situational comedy arising out of a lies told by a young office assistant about going on a belated honeymoon. 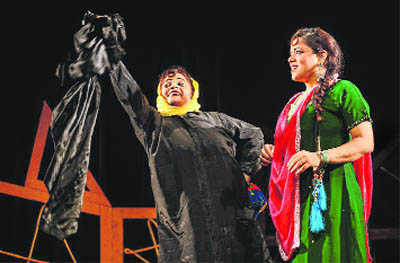 The historical play recounts the heinous mass killings and looting by invader Nadir Shah in 1739. It draws a comparison with today’s scene, which is dominated by terrorism, corruption, social and religious bigotry.